Here's a pair of undated and unannotated photos taken at the same time that must be (from appearances) from the late '80s or early '90s. I have no memory of the get-together that allowed this to happen. 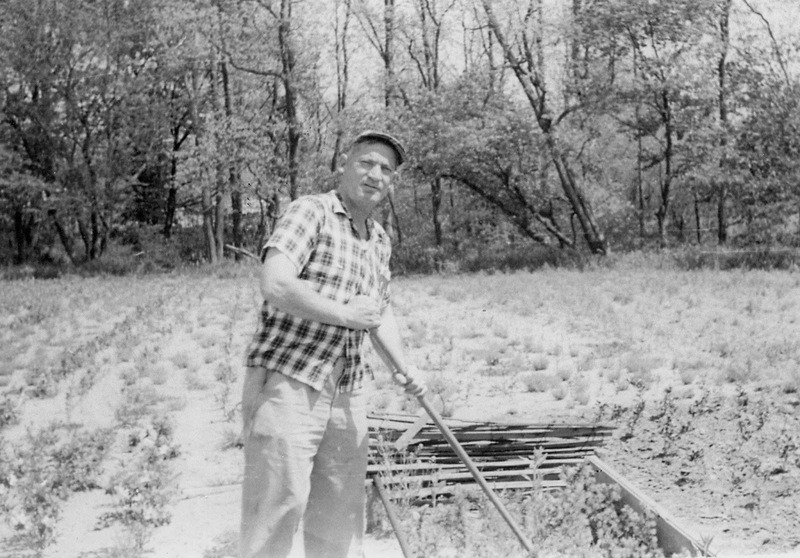 I think these must have been taken on my parents' farm in Robbinsville, from the yard where our clothesline used to be (I think! ), looking toward the east-northeast. 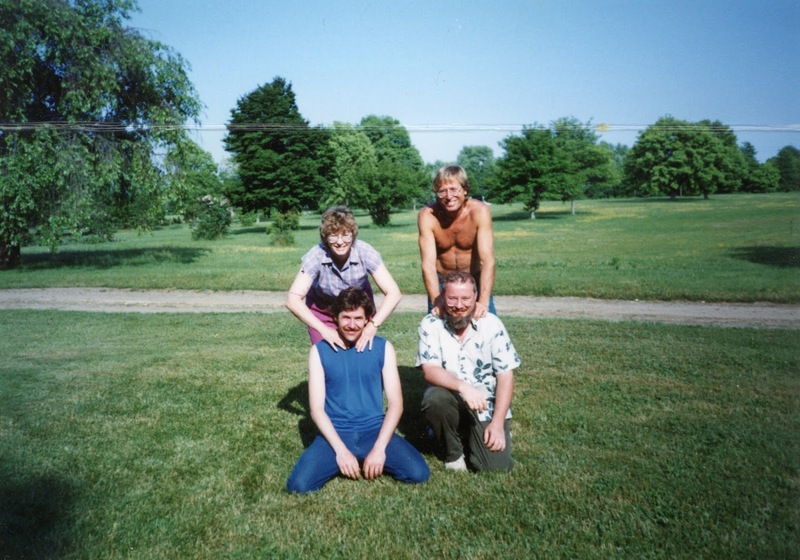 The left photo has (starting at the lower left and working clockwise) my brother Mark, my sister Holly, my brother Scott, and me. 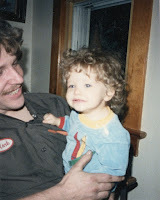 Scott looks like John Denver in this photo, doesn't he? 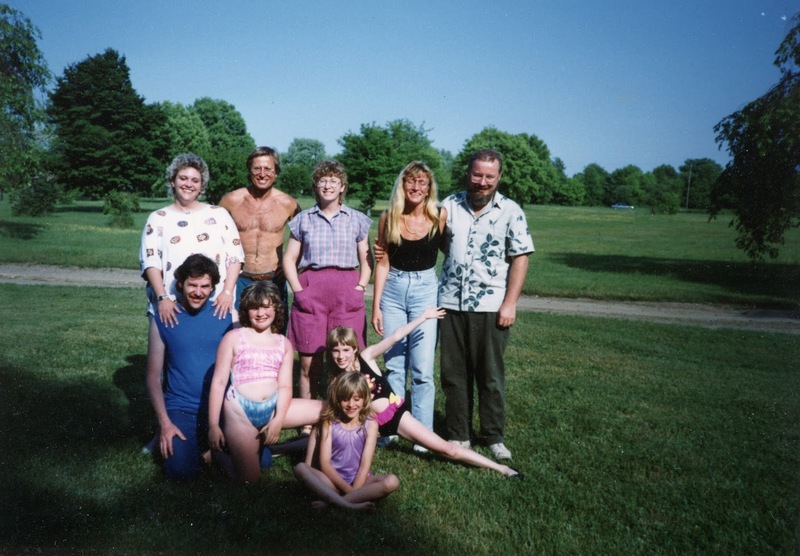 The second photo has a more extended clan: Mark, his then-wife Rolana, Scott, Holly, Debbie (my wife), me, Amber (Holly's daughter, with arm outstretched), Tami, and Marci (next to Mark). The last two are daughters of Mark and Rolana. In that second photo is the clue that let me know where this was taken: a car zooming by on US 130, and a utility pole and wires running alongside it. I love this photo! 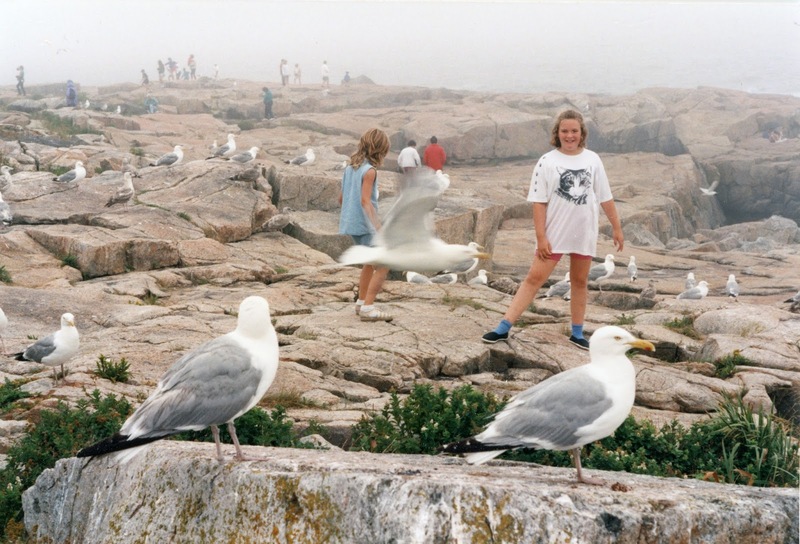 On the back, in my dad's printing: “Tami + Marci trip with granma and granpa to tip of Schoodic Peninsula in Maine”. That would be Schoodic Point, a place I remember very well from visits as a kid. The lab dated this photo as August 1995, and that fits the apparent ages. I like the way the fog there makes the others in the photo fade out, and keeps the girls in the foreground – and being photo-bombed by a seagull is pretty cool! 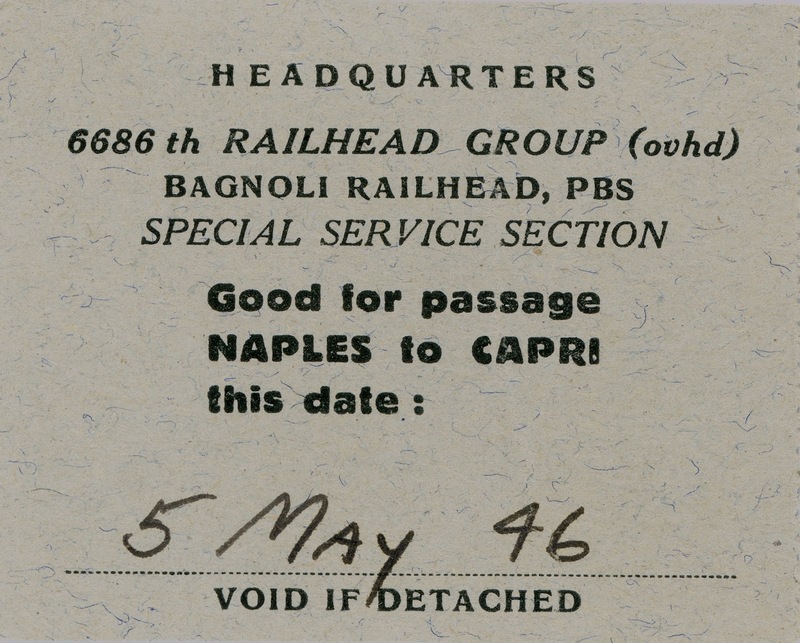 Here's something that isn't a photo, but an actual artifact: the half of a railway ticket from Naples to Capri, presumably taken by my dad when he was stationed near Naples, Italy during WWII. 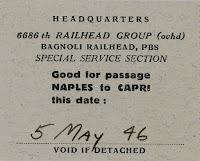 I searched for information about the organization mentioned or the Bagnoli Railhead. Other than simple mentions of their existence, I found nothing. The date is interesting – it's just three months before my dad demobilized at Fort Dix, in New Jersey, and a year after the German surrender. I hadn't really realized that my dad had over a year in Italy after the war ended. I knew, from conversations with him, that he had traveled extensively all over Italy, especially along its west coast and the northern mountains (including one brief trip into Switzerland). It seems he had plenty of time to do that! I believe I've posted a lower-quality version of this photo previously, or one very similar to it. I found a better copy, and here it is. 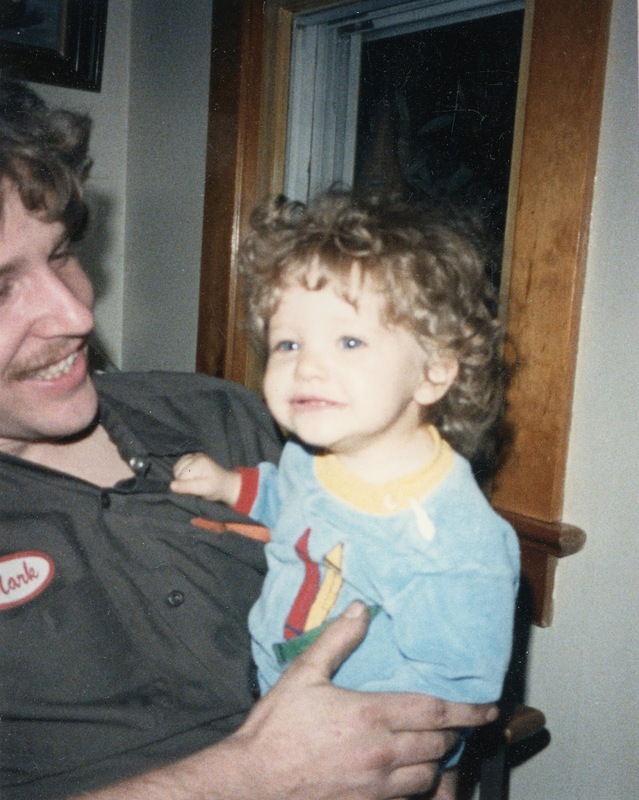 On the back, in my mom's handwriting: “My wonderful Dad, at work in his nursery”. This is a modern copy of an older original that I don't have (or at least, haven't found yet). My grandfather looks a bit younger here than my memories of him, so I'm guessing this was taken circa '50. The plaid shirt and cap are characteristic. I don't recognize the field, but there aren't many visual cues here. Here's another modern copy of an older original, and again I think I've posted something like this earlier, but not of this quality, so here it is again. On the back, in my mom's handwriting: “Elinor & Bonnie Lee 1943”. 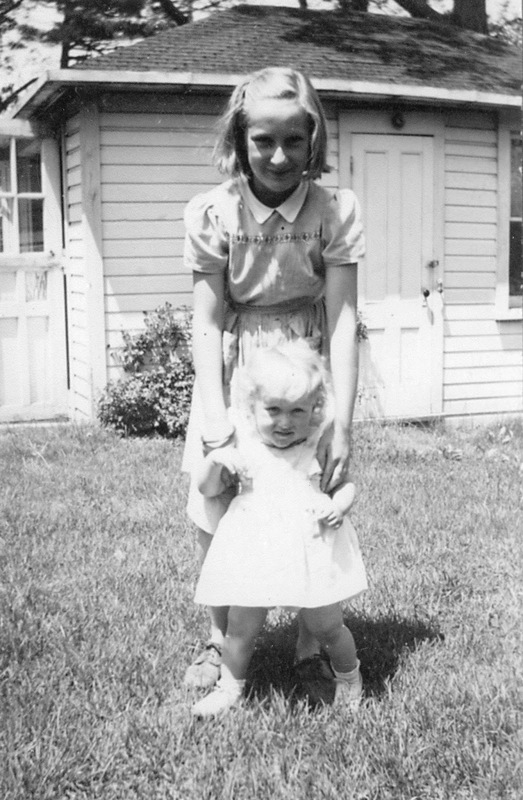 My mom would have been 10 or 11, and the war was raging in both Europe and the Pacific. I don't recognize the house behind them, but I'm guessing it was the Highlands, New Jersey home that I believe her parents had at that time. Bonnie Lee is my mom's younger sister, my aunt.